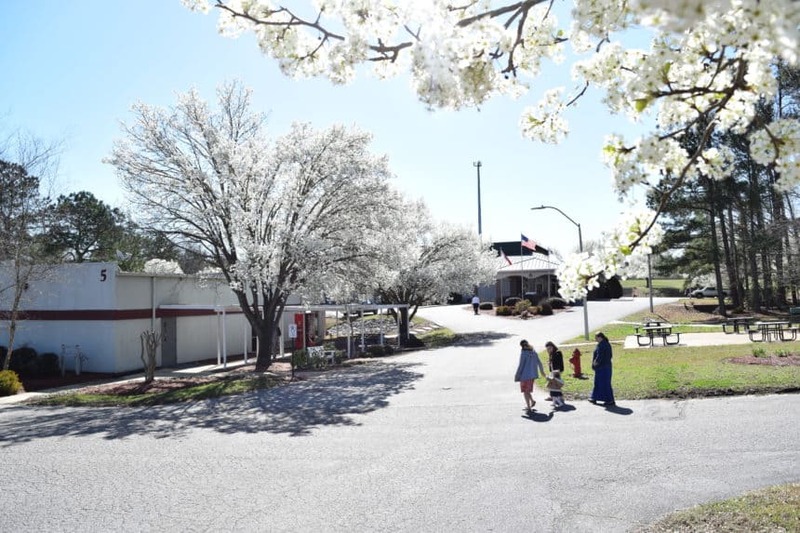 On February 15, 2018, the Board of Directors voted to ask the Parkers Chapel Free Will Baptist Church in Greenville, NC, to take in Southeastern Free Will Baptist College as a ministry located on their property and operating under the care of their local church. On Sunday night, March 11, 2018, Pastor Gene Williams presented the request to the Parkers Chapel Church for their consideration. The following information is all contingent upon the vote of the good folks of Parkers Chapel Church. In this age of rapid information transfer, we believe it unfair to pressure Parkers Chapel Church by sharing too much information, but also unfair not to keep our constituents abreast of our prayer needs. 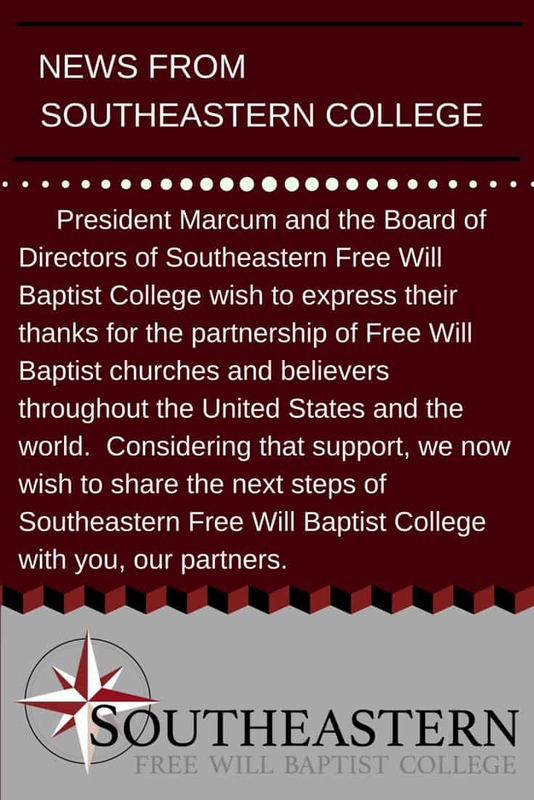 We ask for your understanding as we show respect to all who love Southeastern and Free Will Baptists. Southeastern has always maintained an understanding that the first area of service of our ministry, faculty, and students is in and through a local church. We believe that such a move will help us to better fulfill our mission by being more closely associated with a local church. By moving the college to a local church, the Board of Directors believes that there will be opportunities to share facilities and personnel. This will lower the operating expenses that the college has on the current campus. Our lower student enrollment can more easily be maintained until numerical growth returns. Private college enrollment is cyclical in nature, and we expect this move to provide even greater opportunities for numerical growth. A little over five years ago, when Rev. 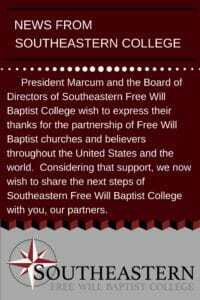 Jim Marcum accepted the role of president of Southeastern Free Will Baptist College at sixty-three years of age, he and the Board of Directors believed that his tenure would be approximately five to seven years. President Marcum has sensed for some time now that Southeastern’s reuniting with a vibrant local church is the preferred path for stability and growth. During the February Board of Directors meeting, President Marcum, in his vision to unite the college with a local church, shared his willingness to step down as president and serve in whatever capacity the Board of Directors viewed best. President Marcum has offered to continue maintaining a close relationship by serving as an adjunct professor in the pastoral department and traveling for the college. In the request for the Parkers Chapel Church to receive the college, the Board of Directors also asked Pastor Gene Williams to assume the role of president of the college. This change will unite the leadership of both the church and the college. The Southeastern Board of Directors will continue providing oversight and guidance of the college and the accreditation progress will not be inhibited in any way. In Greenville, the Board of Directors also believes that there are potential faculty members who may even expedite the accreditation path. When will this transition take place? That is a difficult question. The original plan was to sell the property, build offices and dorm buildings and move in the summer of 2019. Nevertheless, there are interesting possibilities developing in the student housing area which may allow the fall of 2018 to be the start date. We will keep you posted on these developments. We earnestly request your prayers and support as we cautiously move through what we believe to be God’s will in our next steps. Pray for the dear folks of Parkers Chapel that they may have peace about God’s will as they vote on April 1. Pray that we will be able to come to an agreement with the complex across the street for our student housing. Pray that we will receive approval for federal aid this Spring. Pray that we will be able to bring in the right professors in our classes to move us toward accreditation as soon as possible. Pray that God will give Brother Gene wisdom as he begins to lead both ministries on July 1. Pray for the many details that must be worked out in this transition. Pray for our Board of Directors, Administration, Faculty, Staff and Students as we are facing the months ahead. For the past few days President Jim Marcum and the administration, faculty and staff of Southeastern have hosted an Evaluation Team from the Transnational Association of Christian Colleges and Schools (TRACS). The team of five were from TRACS Institutions in California, Oklahoma, Virginia and Maryland and were accompanied by TRACS Field Representative, Dr. Tanmay Pramanik. The team visited our campus to examine and inspect our college in anticipation of receiving Candidate Status which is a major step toward Accreditation. In the past few months, our staff has been busy compiling a self-study which is a self-evaluation based on the standards in the TRACS Accreditation Manual. The Visiting Team verified our self-study and, in addition, conducted interviews, inspected records, observed classes, participated in chapel and toured our facilities. They left us with a report that included 16 suggestions, 33 recommendations, and 2, very hard to get, commendations for us in two vital areas. First, they recognized the “passion and commitment to the mission of the institution” of our Board of Directors, administration, faculty and staff. We at Southeastern are fully committed to the task of “training men and women for church-related ministries.” It is important to us that we are all in one accord and working together to fulfill this mission. We are grateful for this recognition. The second area that the team thought was exemplary was that we are completely out of debt. Southeastern is situated on 60 acres of land in an area that has increased in value a great deal during the past 29+ years that we have been in North Carolina. We struggle with “cash flow” and continue to need support to help keep our tuition affordable for our students. But it is a tremendous blessing to have such a strong financial base. To God be the glory! The 16 “suggestions” that the Visiting Team left us are not mandatory changes but, if implemented, will improve our college greatly. The 33 “recommendations” are each tied to one or more of the TRACS standards and must eventually be addressed before we can become accredited. For now, however we will need only to devise a plan to address all 29 of the recommendations and send that plan to TRACS by February 15th. Four of the 33 recommendations pertain to what TRACS calls the Institutional Entrance Requirements (IER’s). To be granted “Candidate Status” we must be in “Basic Compliance” which means we satisfy all of those IER’s. The good news is that those four recommendations can be fixed and we are confident that we will be granted Candidate Status at the semiannual TRACS Commission meeting on April 26th. When can we be Accredited? Once we have Candidate Status we have 5 years to become accredited. It is our hope and belief that we can comply with all the TRACS standards and become accredited in three years. We believe that we have a path to possibly obtain accreditation in two years. However, if it takes four or five years we will not be deterred or discouraged. We can do this! We need your prayers. Our greatest need is the power of God on our campus and our work. Our next greatest need is students. Please pray that God will impress on young men and women to answer the call to His service as the need for workers in His vineyard has never been greater. We also need your continued financial support. In fact, the accreditation process places even a greater strain on our budget. We need extra funds to expand our library, help many of our faculty to take needed graduate courses, pay our TRACS dues, attend necessary conferences, etc. We have also hired a part-time librarian which is an expense above our expectations for the year. These are exciting days. Please feel free to visit the TRACS website at www.tracs.org for more information about the process. Also, we will be happy to answer your questions. And, don’t forget to PRAY, GIVE and URGE young people to seriously consider Southeastern.